New Year's resolutions last about as long as a snowman in July. A couple of days into January, you're feeling motivated…ready to quit coffee, climb Mt. Elbrus, file your taxes early, clean out your garage, and maybe take up sailing, to boot. But after the first few weeks of trial and tribulation, it's often all too easy to shelve those lofty goals until next year. We asked Brandon Marsh, professional triathlete and coach, the best way to start the new triathlon season, from how to set goals and stick to them to finding the right balance in training. Read below for his responses. What's the best way to go about setting realistic goals? Look at past years' performances and set specific goals for swim, bike, and run improvements. These can be pace, power, or just making sure you get out the door and focus on your key workouts more. Evaluate you realistic training time, and adjust your goals and expectations accordingly. Improvement will come from training "smarter," training "more," and from the additional year that you have in your legs! Try to focus goals on performance as opposed to times or placings...courses differ even year to year. Conditions are variable, so even if the course is the same, comparing a time year to year may not be the best thing, and you cannot control who else shows up at the race. Control the controllable. How often should I race? What's the best way to put the race season into perspective? The amount of racing you decide to do will probably depend on your personality. With the focus so many have on IM distance events, a lot of athletes miss out on the fun of racing just for fear of missing a long ride or run. It helps to realize why you are doing the sport. Is it your job? Is it a stress reliever? If so, try not to allow triathlon to just create more stress. The season is long, so treat it as a long race and pace yourself! After the off season, when should I start ramping my training back up again? Ramp the training back up whenever you feel ready or at least get started with training again when you feel ready. Maybe you feel sick with yourself that you've taken so much time off or eaten so much junk or put on a few pounds. Or maybe you have started to "miss" the training. Those are good indicators that it is time to get going again. “Off season” can be a bit of a misnomer for some. A lot of triathletes put in a run focus and end with a marathon in the early spring or late winter. I say do the training but don't run the marathon if you need a run focus. Whatever your “off season” is, it's a good idea to find a loose structure that you can maintain and try to stick to it without being too psycho! What are some tips for finding the right "balance" in training? How do I find the right mix of volume vs. intensity, frequency vs. duration, and time devoted to each sport? How do I know when more is beneficial and when more is going to get me hurt? This really is an individual question as no two athletes are the same. Typically, the injuries that triathletes get are overuse type injuries, and typically they show themselves while running. But, generally I like to encourage athletes to have two key swims, bikes, and runs each week. If you have more time, fit in additional easy workouts around those six key sessions. Try to run more frequently, and keep the runs shorter and easier for a while. Begin to add to one run until you reach 60+ minutes. Then start adding to a second run so that you have two key runs a week. For cycling, most athletes will be able to handle a little bit more intensity and volume. But, I think that for some a bit more intensity...especially in the winter/indoor months…can go a long way. This can also help us in Austin where it is really easy to be really fit all year. So, you might have one ride that has some shorter efforts and another with longer efforts. The swim, same as riding, especially since no one likes getting in a pool when it is cold. Make the sessions count. Put in a good effort when you swim. Don't just get in and float around. Work on your stroke in warm-up and cool-down, but get after it in your main sets. What are important things I shouldn't forget to incorporate in my training? Mainly don't forget to vary your training. We will all gravitate towards workouts we like, but don't neglect doing the ones that you don't particularly like or that challenge you every once in a while. Do some of the small things. Personally, I like to do some TPTherapy work in the evenings in front of the TV. I like doing some very basic planks and core work, but you don't have to go out and buy the latest gadget (TRX for example) to make it work. Just a few minutes of those two things can help keep you ahead of the injury game. Since most of us have pretty "sedentary" jobs, get up and walk around a bit just to not be sitting all day. Keep it fun, and keep it social when you need to. That will help your longevity in the sport more than the latest training fad. 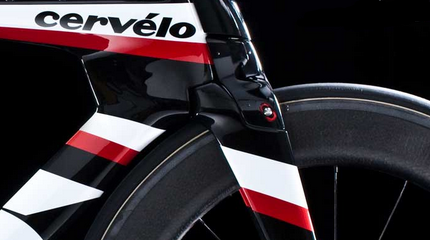 The Cervelo P5 Unveiled: Simply Faster! The Union Cycliste Internationale, ruling party of all things bike racing, has been busy "clarifying" rules pertaining to bike design for most of its history. Frames and bike parts deemed legal for years are often found, quite suddenly, to be illegal. Recent victims have included the Specialized Transition, P4 water bottle, Cervelo seatposts, and the much-loved Vision time trial bars. Growing weary of the changes and restrictions, which strike many as arbitrary and superficial, triathletes have campaigned for bikes that do not adhere to UCI rules, since most triathlons allow for much more design freedom. Bike makers have begun to answer the call. Spy pictures of a UCI-illegal "Illicito" from Quintana Roo have surfaced. Specialized had a brilliant release of the Shiv Tri, with Craig Alexander's Kona win as a fitting introduction. 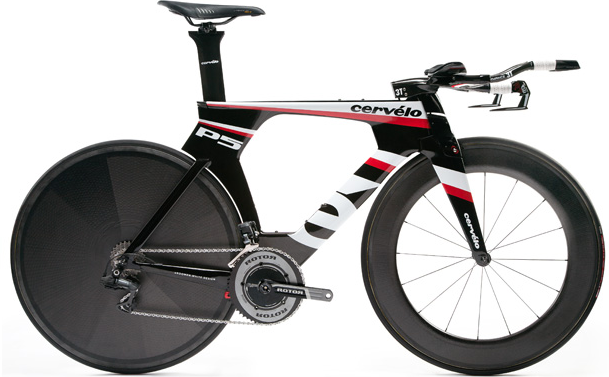 Now Cervelo has released their offering, the P5, which features a UCI-illegal fork, seatpost, and front end. But don't fear, roadies – there's a UCI-legal configuration as well. Full details on the aerodynamic advancements have not been released yet (a whitepaper is coming) but the Cervelo website hints at the P5 being "30 seconds faster over 40k." It's not known if they are comparing the P5 Tri with the P4, but if so that would represent a significant leap forward, given that the P4 was already among the fastest, if not the fastest, bike on the market. The time savings implies that Cervelo may have trimmed another 75 grams of drag from the P4 to the P5, which would make it a complete outlier among bikes today. The P5 frame features a bit more stack than the P3 in order to better accommodate the typical triathlete position. Those who prefer super low positions are not out of luck, however, as Cervelo assures the aero-minded that their 3T Aduro bar in X-Lo configuration allows lower positions than could be achieved on a P3 or P4. They claim the P5 allows more than enough adjustment to accommodate the entire Garmin team's positions, including Aero God Dave Zabriske. 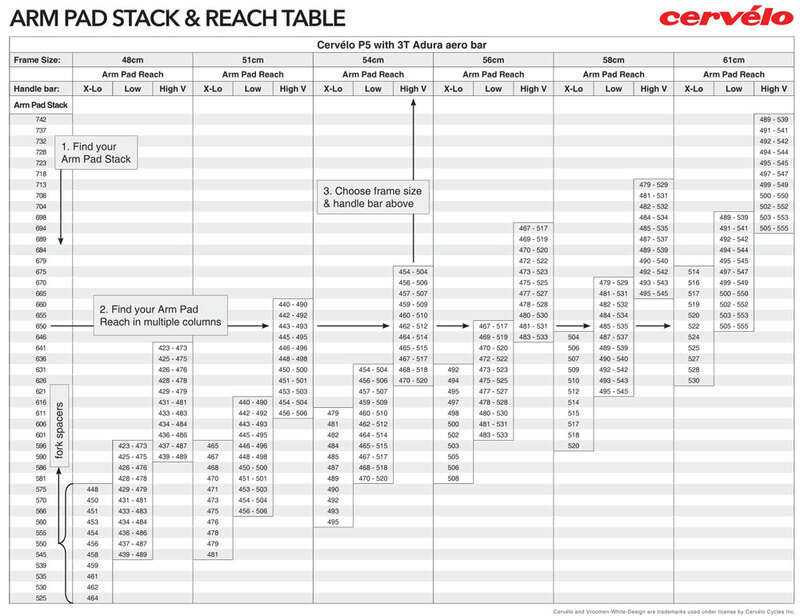 Cervelo has provided a stack and reach chart to aid in sorting out their new integrated aerobar system (below). When using the 3T Aduro bar, large stack adjustments are made with the 3 different configurations (X-Lo, Low, High-V). Fine tuning of the stack is done with under-stem spacers shaped to match the integrated stem. These under-stem spacers, once finalized, can not be adjusted much once the fork is cut to size. You can however make adjustments later with armpad riders. Any 3T, or Vision aero arm pad spacers will work. 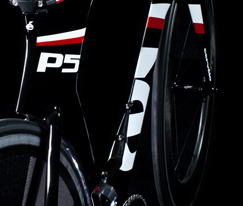 Standard on Cervelo's S5 and R series bikes, the P5 is now the first TT bike to be offered with BBright. The BBright bottom bracket takes advantage of otherwise unused space on the non drive side by using an asymmetric shape to increase stiffness and reduce the weight of the frame. Additionally it allows cranksets to improve stiffness and/or weight as the non drive side crank arm can be straighter. In the end, the BB+Crankset system as a whole can be designed stiffer and/or lighter. The P5 will ship with Rotor 3D cranksets, and BBright cranks are currently available from SRAM, FSA, and Tune as well. Many other cranks can be made to work with adapters if desired. A feature carried over from the P4 is the dropped down tube. Cervelo combines an integrated fork that fits neatly into the frame and a dropped down tube that hugs closely to the front wheel. The design maintains an airfoil leading edge along this curve around the front wheel, rather than a cutout, which would add drag whenever the wheel is not pointed exactly straight ahead. On the Tri version of the P5, the UCI-illegal fork integrates seamlessly with the aero brakes for a beautifully integrated front end. -The P4's integrated water bottle solution proved to not be very popular. The P5 has thus moved to the solution found on the S5, a truncated airfoil shape on the downtube that directs air around your water bottles, reducing the aero penalty of carrying a standard or aero water bottle. -The P5 features mounting bolts on the top tube behind the stem, allowing for seamless and secure attachment of accessories of your choice, such as the P5 specific bento box from Dark Speed Works and a very slick, upcoming product from TorHans as well, to be released soon. -The P5 offers a "HiddenPocket™" compartment behind the BB to store a Di2 Battery, and could perhaps be used to store a multitool or other small items as well with some modification (though rear wheel removal would be necessary to access it). 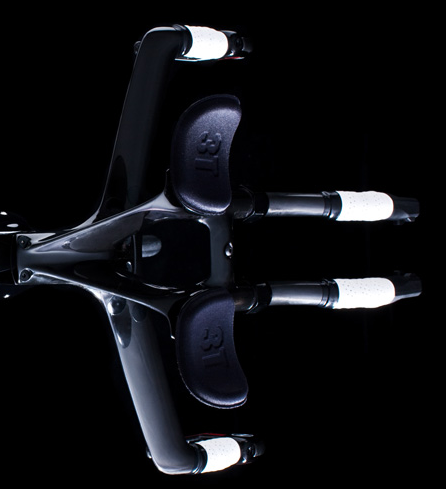 -The 3T Aduro aerobar includes mounts to place a water bottle between your aerobar pads, a hydration solution shown to often reduce drag significantly. -A interesting bolt is visible on top of the BB area that may be present to allow integrated flat kit solutions to be mounted. TorHans is working on a product to fit seamlessly into this area, details to come soon. This offering is a first for tri bikes. While the P5 will happily accept normal cable actuated brakes, the tri frameset and both complete bike offerings come with the new Magura hydraulic TT brakes. Magura has been building some of the best mountain bike brakes for years. Cervelo worked with Magura to design a road bike brake and brake lever that was as aerodynamic as possible. The hydraulic setup allows for an extremely aerodynamic brake, with all cables hidden from the air, without sacrificing stopping power or modulation. The brakes easily allow new wider rims to fit, offer easy adjustment and quick release, and have a 5 year warranty on fluid loss. 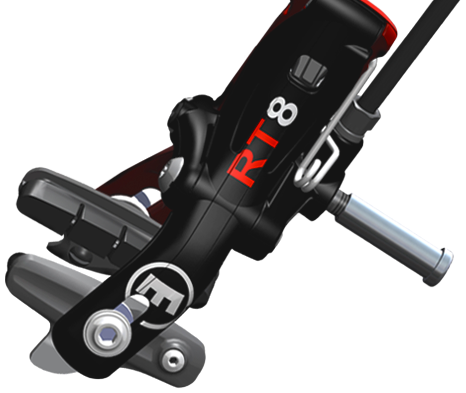 Total weight is only 495 grams for the RT8 version, which includes the Cervelo-designed aero brake levers, and fluids. Those who don't wish to use the hydraulic brakes can still use any brake they like, as all mounting points are completely standard. While the front end of the P5 appears very proprietary, the entire bike can use normal parts at all locations. The front brake mount can accept any standard brake, the rear brake can accept standard calipers, and standard stems and aerobars can still be used. Assembly of the bike for travel is perfectly normal and requires no special tools or extra time. The Magura brakes allow for great aerodynamics without the usual difficulty of adjustment and wheel changes associated with center pull brakes. Cervelo also says that all current wheels on the market, including the extra wide wheels from Zipp and HED, fit in the P5 frame. 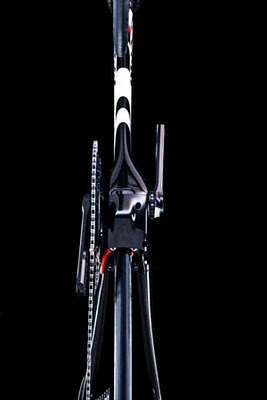 Included in the UCI-illegal frameset is the 3T Aduro aerobar. This is available in three configurations (X-Lo, Lo, and High-V), offering a wide range of stack to suit any rider. Cervelo claims that all three configurations are essentially identical aerodynamically, so there is no penalty for those who need more stack. Stack can be fine-tuned with integrated fork spacers, and reach is adjustable in a 5cm range. See the stack and reach chart above in the fit section for details. 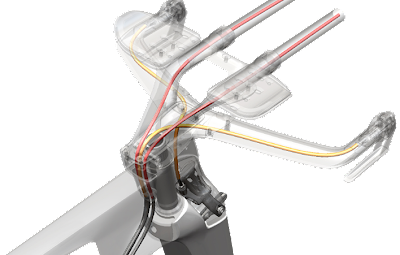 Cables are routed through the bar completely internally, never seeing the light of day as they enter the frame under the cover of the integrated stem. The Aduro also features a clever bottle mount system, so zip ties are no longer required to "torpedo mount" a bottle between your arms. The Aduro is not included in the UCI-legal bikes, but it is UCI legal, so roadies looking for the fastest setup may want to pick this up too. The X-Lo configuration of the Aduro features a very low stack, which allows for aggressive positions even though the P5 frame stack is higher than the P3 and P4. Cervelo also claims this is the fastest aerobar they have ever tested, and they have tested the much lauded Ventus and USE Tula. The Ultra Provocatorio has a very unique race format in that teams of five compete together in somewhat of a time trial for roughly 100 miles…and the race route is not revealed until 45 minutes before the start. This is the second year for this event put on by our friends of Team Wooly Mammoth. I was the only one on my team to have participated last year so the duties of team captain went to me. 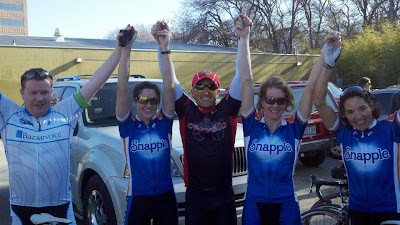 Ideally we would have our five ladies of Team Snapple ATC all together, but that was not to be this year; so we added two guys (Mike Minardi, Andy Maag) to our team of three ladies (Missy, Marla, Leah). Last year I believe this race was advertised as a five person team time trial (but not allowed to use TT bikes, helmets, etc. )…this year it was advertised more as a team “fondo," which translates to “team fun event." Since none of us had ridden 100 miles in recent memory (and one of us had never ridden 100) we went in with the “let’s make this a good training day" approach. Thankfully the weather was on our side as it was a beautiful sunny day with cool temperatures and not much wind. Team captains got the cue sheets (race route, it was only 94 miles!) 30 minutes before the start with race officials making sure to point out important items on the cue sheet…such as the three sections of “off-road” which they termed “pave” on the cue sheet. Our team went over the cue sheets/race route and the first thing Andy says is “how do we get across the water? Swim or boat?”. The cue sheet took us over Lake Austin…and not on a bridge…and we were to complete the last 20 miles on some serious hills (like last year). Race officials didn’t say anything about the water crossing; they just insisted that we make it to the checkpoint at 74 miles. This was going to be an adventure!! We taped the cue sheets to the top tubes of our bikes and started the event… Teams left every 2 minutes, 24 teams total. We had to be conservative in the beginning as there were a lot of turns and we had to consult the cue sheets quite a bit so we didn’t get off course. Then we had the three sections of off road…mostly packed dirt with small rocks…8 miles. We made it through this pretty well as we weren’t the fastest, but we also had zero flat tires (many people had flats in these areas!!!). We were like the tortoise in "the tortoise and the hare” story. Miles 30-75 we got in a good rhythm. Mike led mostly, Andy took the back mostly, the three ladies all stayed in the middle and shouted out directions - me with page 1, Marla with page 2, Leah with the most accurate odometer. We had gone south towards Lockhart, crossed I-35 in Buda and wound our way through Old San Antonio Rd to southwest Austin (Escarpment, Southwest Pkwy, Barton Creek Blvd). At mile 75 (after climbing Barton Creek Blvd!) we stopped at the rest stop and were informed that there was a course change and that we would not be crossing the water in a boat as planned. Mixed feelings. Though I like the idea of a boat being part of the event…I didn’t know if my legs would like sitting for a bit and then climbing big hills for the last 20 miles. So, after refueling we took off for the hills of West Austin for the last 10 miles (Bee Caves, 360, Westlake, Toro Canyon, High Road, some super steep neighborhood streets I had never been on, Stratford, Rollingwood). We finished at Austin Tri-Cyclist where there was food, beverages, and a lot of discussion about the day. We had a great time!! We all rode solid!! I would do this again!! From the talk I was hearing at the after party it seems everyone felt the same. Beautiful scenery, mild temps, rolling hills, and the crystal clear Frio River... 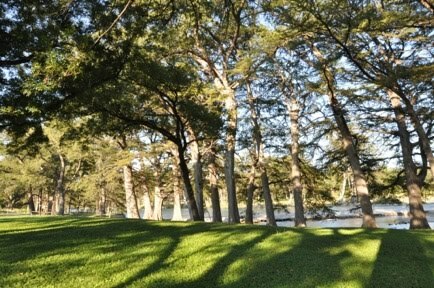 The Texas Hill Country is the perfect place to hone your swim-bike-run skills before the peak of tri season. This winter and spring, Big Pistachio will host three multisport camps in Concan at the Seven Bluff Cabins. Coaches Siri Lindley, Brandon Marsh, Susan Farago, Claudia Spooner, Rosemary Hohl-Chriswisser, and David Garza will lead daily workouts and conduct hands-on clinics, lectures, and active workshops. During your three days of training, you choose which workouts and seminars to attend, with options ranging from Brandon Marsh's "Confidence in the Water" and Susan Farago's "Altitude Training – How to Race at Altitude and Live at Sea Level" to David Garza's "The Fourth Discipline – The Art of Transition." Erin Truslow, founder and owner of Big Pistachio, was inspired to host the camps after a visit to the venue. Situated on 48 acres, Seven Bluff Cabins includes over 1,000 feet of Frio River frontage lined with towering cypress trees and live oaks. "It's just so amazingly beautiful, so peaceful and calm," Truslow says. "Every time I'm there, I can't help but think about how I'd like to stay there for a week and swim, bike, and run." The Frio River, slow-moving and spring-fed, is roughly five-feet deep in most places, which makes it ideal for swim practice. But since "Frio" is the Spanish word for "cold" (by all accounts, a fitting name), participants are encouraged to bring a long-sleeved wetsuit. 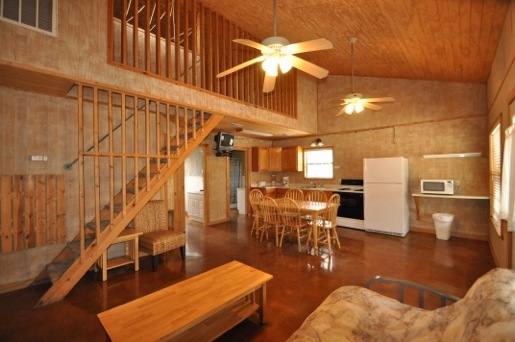 Rentals will also be available. Truslow says that the camps take a unique approach – instead of a structure promoting a single coach working with a specific team or group, Camp Multisport offers up to five coaches per camp and caters to both individuals and teams. Benefiting from the coaches' different methodologies and expertise, athletes have the rare opportunity to "try out" several coaching philosophies at one time. Camp Multisport featuring Brandon Marsh (February 24-26) is open to beginner, intermediate, and advanced-level athletes. Based in Austin, Brandon Marsh is a professional triathlete and coach; this camp is a good fit for those looking to set a new PR. Camp Multisport NO BOYS ALLOWED! (March 2-4) is a women's only camp coached by women, and is particularly well-suited for first- or second-year athletes. Camp Multisport featuring Siri Lindley (April 5-8) is open to all intermediate, advanced, and professional athletes, as well as coaches. Lindley, a two-time World champion, coaches age-group and professional athletes, including Mirinda Carfrae, Leanda Cave, and Luke McKenzie. To learn more about Camp Multisport, visit the website or contact Erin Truslow (512-517-8118, erin@campmultisport.com).